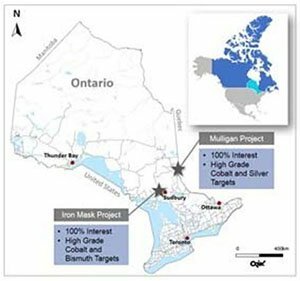 After ten months of strategic focus on acquiring primary cobalt projects, ASX small cap Meteoric Resources (ASX:MEI) has secured 100% ownership of four impressive primary cobalt projects in the mining friendly jurisdiction of Ontario, Canada. Driven by the rise of electric vehicles, and their projected growth going forward, MEI has recognised that there’s money to be made in this field. As a vital ingredient in the production of rechargeable lithium-ion batteries that are required to power electric vehicles, cobalt is a commodity worth having exposure to. As mentioned, this is an early stage play and investors should seek professional financial advice if considering this stock for their portfolio. The company now has exploration work planned across all four of these highly prospective primary cobalt projects — the Mulligan Cobalt Project, Iron Mask Cobalt Project, Burt Cobalt Project, and the Mulligan East Cobalt Project. 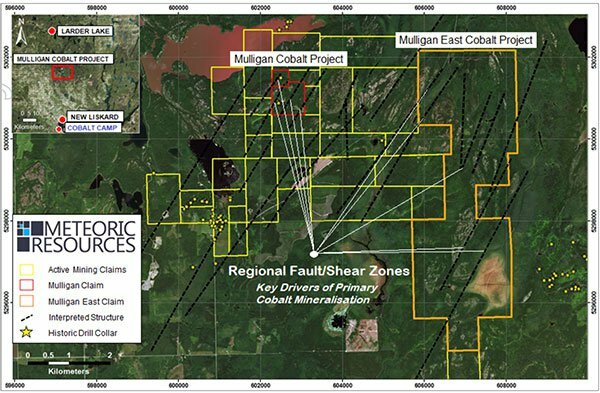 Geophysical and geochemical exploration of the two highest priority targets — Mulligan and Iron Mask — is due to get underway in early 2018 with drilling planned to commence at Mulligan July 2018 and drilling at Iron mask to commence September 2018. The other two projects, Burt and Mulligan East, are at an earlier stage of exploration but should have drill targets ready in preparation for exploration in the Northern winter — meaning that exploration across the portfolio can continue year round. These projects add to MEI’s existing operations in Canada, most notably its 100% owned Midrim Copper-Nickel Project that’s 85 kilometres south of the copper mining and smelting region of Rouyn-Noranda in Quebec. Midrim preliminary metallurgical testing has delivered positive results. All that’s left now to progress the project is the finalisation of a bulk sampling study targeting the shallow, high grade mineralisation within the Midrim Main Zone. With a number of promising projects, combined with a great exploration team — including a new in-country cobalt project manager, and a fully funded exploration field program, the company has all the ingredients needed to deliver value to shareholders. 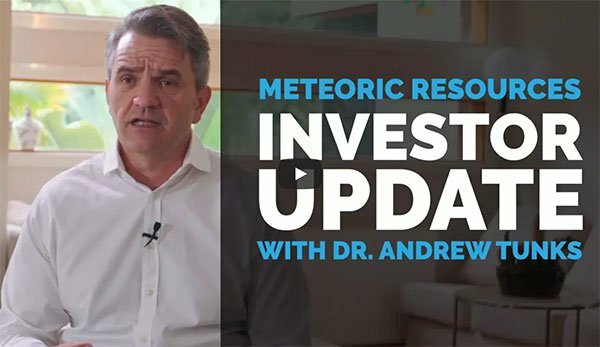 Canadian-focused cobalt and copper-nickel-platinum group metals (Cu-Ni-PGE) explorer, Meteoric Resources (ASX:MEI) is gearing up for exploration at its newly acquired and highly prospective cobalt and Cu-Ni-PGE projects in Ontario, Canada. As the company’s Managing Director Dr Andrew Tunks said, MEI has directed its attention to, “cobalt, cobalt, cobalt and getting the drill rigs turning as soon as possible”. Mulligan Cobalt Project — ground geophysics and drilling. Iron Mask Cobalt Project — geochemistry, airborne/ground geophysics and drilling. Burt Cobalt Project — mapping and geophysics. Mulligan East Cobalt Project — mapping, geochemistry and geophysics. These projects are categorised into two groups: Mulligan and Iron Mask where mapping preliminary work has been completed and Burt and Mulligan East which are at an earlier stage of exploration. MEI plans to commence geophysical works at Mulligan and Iron Mask as soon as practicable and should have drill rods turning on those projects by mid-year. As for the earlier stage projects, working on them over the Northern Summer means that MEI should have drill targets ready to keep the exploration going through winter. Mulligan and Iron Mask Cobalt Projects are ranked as MEI’s priority 1 primary cobalt projects, and as such will have the greatest exploration focus during the 2018 campaign. Drilling is due to commence at Mulligan and Iron Mask mid-2018. Here’s a look at where the projects are situated. Mulligan is the most advanced cobalt project in MEI’s portfolio. Rock samples taken by MEI confirm the high-grade cobalt at the Mulligan Project, returning 9.71% cobalt, 14.3g/t gold and 0.3% nickel. Significant cobalt-silver geochemical anomalies with 209ppm cobalt and 807ppb silver were also reported in soil assays. During late October and into early November, Orix Geoscience completed a 1:5000 geological mapping program across the Mulligan Cobalt Project, with a focus on known historical Cobalt workings and an aim of identifying cobalt-silver mineralised vein systems. 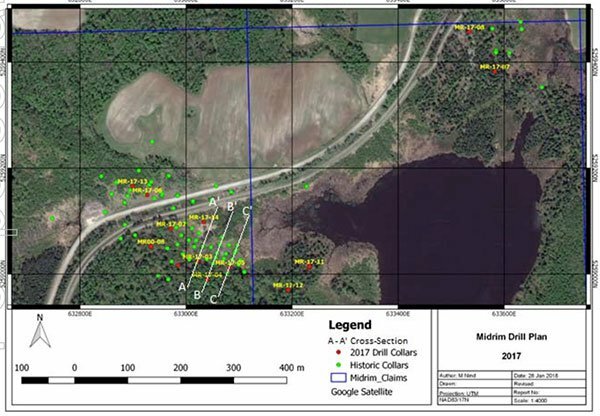 In conjunction with the detailed mapping program, a total of eight rock chip samples and three mullock dump samples along with 276 soil samples taken at 25m intervals along 100m spaced lines. The new mapping and geochemistry results highlight the strong potential for cobalt mineralisation at the Mulligan Cobalt Project and provide MEI the impetus to proceed with the next phase of exploration. This will be a closely spaced IP survey that will define drilling targets that will commence in coming weeks — as soon as the Northern winter allows. Historical samples from the project also highlight the prospectivity of the Mulligan area. These samples included high grades of 12.6% cobalt, 1.03% nickel, 29.8g/t gold and 39.7g/t silver collected by the Ontario Department of Mines in 1952, as well as 19% cobalt and 56.7g/t gold collected by Conwest Exploration, also in 1952. At the time eight-tonnes of cobalt ore was shipped from the Mulligan site for mineral extraction and recovery was 10% cobalt. The next step at Mulligan is a programme of closely spaced (100m lines) ground geophysics has been scheduled for April to May and upon receipt of the 3D interpretation, highly defined drill targets will be generated, with drilling set to commence in July 2018. The new mapping and geochemistry results highlight the strong potential for cobalt mineralisation at the Mulligan Cobalt Project. Of course success here remains speculative and investors should retain a cautious approach to any investment decision made with regard to this stock. The geochemistry results do provide the company impetus to proceed with the next phase of exploration, a closely spaced IP survey that will define drilling targets. MEI’s other high priority project is the Iron Mask Cobalt Project where there are plans for a soil and rock geochemistry programme followed by airborne and ground geophysical surveys to be conducted at Iron Mask during the second quarter of 2018. 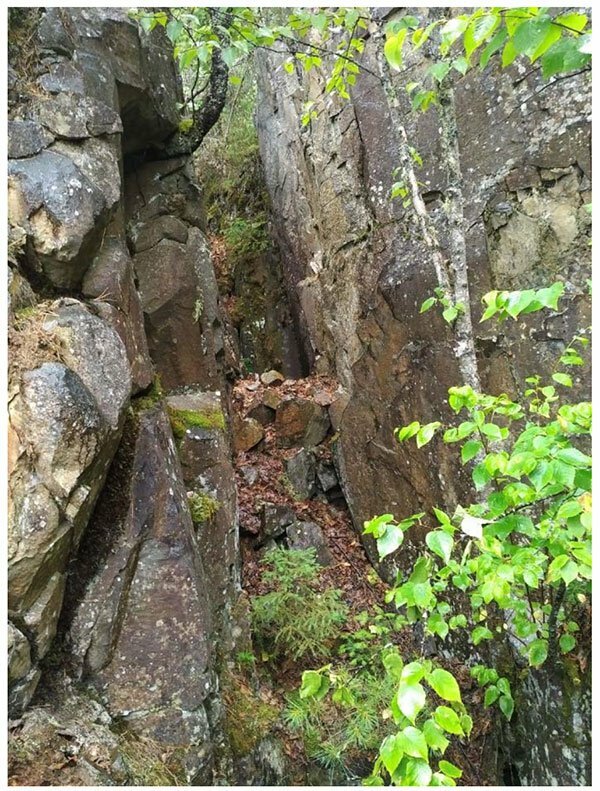 The project is located approximately 500m along strike from the historical workings of the Cobalt Shaft. Here rock samples from around the shaft graded up to 16% cobalt and a six-tonne bulk sample graded 15% cobalt and 279g/t silver. MEI’s secondary, yet still highly prospective Canadian cobalt projects are the Burt Cobalt Project and the Mulligan East Cobalt Project. As earlier stage priority 2 projects, the focus of the 2018 exploration programme for Burt and Mulligan East will be to generate drill targets to allow drilling to continue through the 2018/19 northern winter. The Burt Cobalt Project is located approximately seven kilometres along strike to Battery Mineral Resources /Golden Valley Mines (TSXV:GZZ) JV, Island 27 Project where the weighted average of a 4m historical downhole intercept graded 4.18% cobalt, 12.1 g/t silver, 0.38% nickel and 0.098 g/t gold. 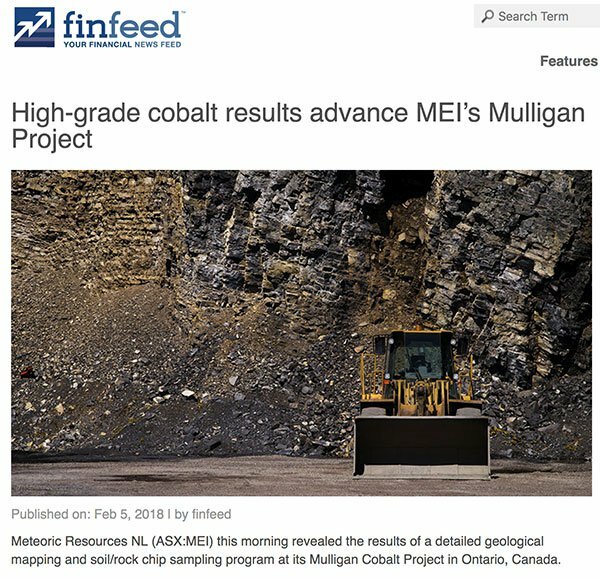 During the quarter ending December 31 2017, MEI staked additional ground prospective for cobalt approximately five kilometres east of the Mulligan Cobalt project. This new ground makes up the Mulligan East Cobalt project and consists of 90 claims for a total area of 13.7 square kilometres. At the project, MEI is targeting high grade silver-cobalt vein style mineralisation similar to that mined at the historic mining centre of Cobalt, which lies 50 kilometres to the south. Encouraging, the nearby Foster Marshall Silver-Cobalt project (3.5km SE of Mulligan and 7km west of Mulligan East) has historic assays of 4.5% cobalt and 87oz/t silver and two veins with a combined length of about 160m. Structures from Foster Marshall can be traced extending into MEI’s Mulligan claims. These prominent NE-trending structures are also prevalent in the staked Mulligan East claim block. A positive about operating in Ontario is that drilling can occur all year round. Because of this, MEI’s strategy is to generate sufficient drill targets to allow for drilling to continue throughout the northern winter. However, as both airborne and ground based geophysical surveys are most effective when conducted with no snow cover, MEI has scheduled its planned geophysical surveys to commence after the winter’s end. 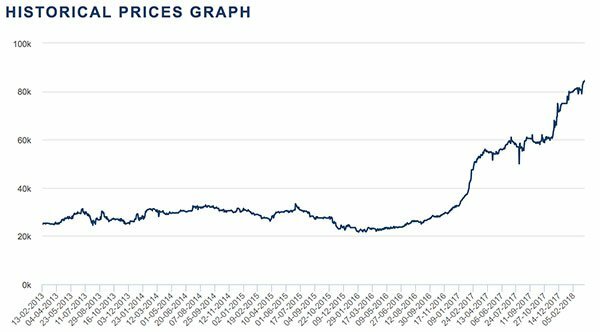 It can be assumed that MEI’s decision to focus on the advancement of its cobalt projects and the impressive recent rise in the cobalt price is no coincidence. Cobalt’s rise since 2016 has been steep and has opened up opportunities for junior explorers who are willing and able to shift their attention. 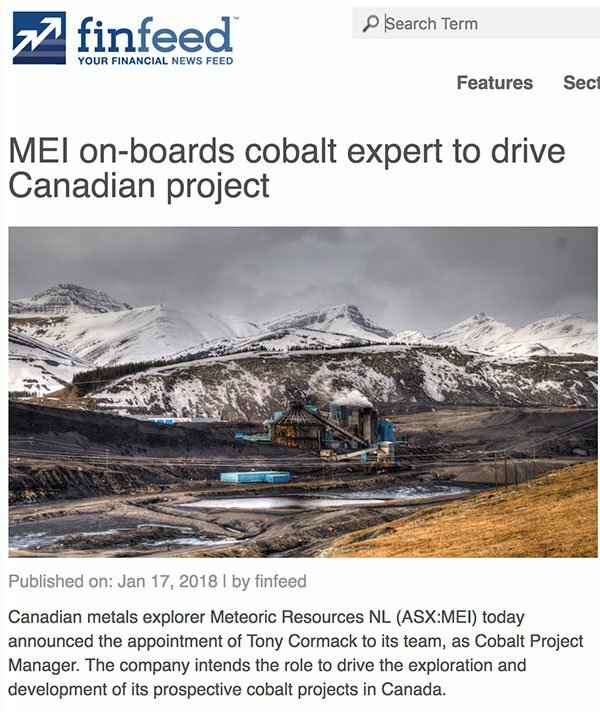 Of course, an investment in any old cobalt project isn’t guaranteed to pay off...and that’s what makes MEI’s acquisition and upcoming exploration programme of these Canadian projects so attractive. It’s also good to have diversified assets so it’s reassuring that MEI’s portfolio also has exposure to copper and nickel. This comes in the form of its 100% owned Midrim copper-nickel project, located 85 kilometres south of the copper mining and smelting region of Rouyn-Noranda in Quebec, Canada. 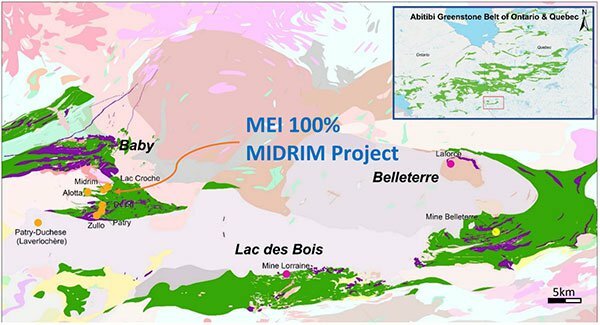 Mineralisation at the Midrim Main Zone occurs in the Baby Segment of the Belleterre-Angliers Greenstone Belt and is hosted within an elongate gabbroic intrusion approximately 330m long and 85m wide. The gabbro is hosted in a thick package of volcanic intrusives, tuffaceous sediments and basaltic rocks that are cut by several trending faults. Historical drilling in 2001 at Midrim defined multiple zones of massive to semi-massive and blebby to disseminated sulphides at the base of a differentiated gabbro sill. The mineralisation is terminated to the south by a west-striking, steeply north-dipping fault. Preliminary metallurgical testing was recently undertaken by SGS Lakefield Ontario Canada on the Midrim core that was taken during a 2000-01 drill campaign. Results were reported on February 21 and they demonstrated exceptional recoveries including up to 95% of the copper and 80% of the nickel being recovered in ten minutes of flotation. Whilst preliminary tests focused mainly on the extraction of copper and nickel, this follow up work utilising fresh core from the 2017 drilling campaign will be used to optimise the flowsheet for marketable concentrate production and the detailed recovery examination of platinum and palladium in detail. Adding to the positive results from the testing of this historical core, MEI now also has results from its maiden drill campaign at Midrim. The company was able to demonstrate the veracity of the historical mineralisation at the Midrim Main Zone through this successful maiden drilling campaign. The program was also designed to test geological and structural controls that govern massive sulphide mineralisation over the project area as identified through downhole and airborne EM surveys. MEI undertook its maiden drilling program at Midrim from November to December 2017 where a total of 15 holes were completed across the project for 2270m of NQ diamond core. A total of 512 core samples were submitted to ALS in Sudbury for analysis. The valuable geological information gathered from this maiden drilling programme will form the basis for all future resource development and exploration drilling programmes. The outstanding assay results also deliver MEI a high level of confidence in the continuity of the Cu-Ni-PGE mineralisation in the Midrim Main Zone. All that’s left now to progress the project is the finalisation of a bulk sampling study targeting the shallow, high grade mineralisation within the Midrim Main Zone. In January, MEI updated its management team to better suit its new strategic direction. Mr Tony Cormack was appointed as cobalt project manager to deliver the necessary expertise in cobalt exploration to further explore and develop the company’s primary cobalt assets. Cormack has 20 years’ of mine and exploration geology experience involving a broad range of commodities including nickel, copper, cobalt, gold, tantalum, graphite and iron. Further, Cormack has a proven track record of taking exploration projects through to production, having held senior positions with BHP Billiton, Aztec Resources, Atlas Iron Limited and Hexagon Resources Limited. His most recent appointment was as Chief Operating Officer of Battery Mineral Resources Limited where he managed the cobalt exploration adjacent to MEI’s Ontario tenure. Additionally, Dr Andrew Tunks was appointed as Managing Director with current executive director Graeme Clatworthy stepping back to a non-executive role. The next phase of the company’s strategy is to fast-track a comprehensive exploration program and drill test targets across all its primary cobalt projects. The work programme will include prospect scale mapping, geochemical surveys, airborne and ground based geophysical surveys along with diamond core drilling scheduled at the high priority Mulligan and Iron Mask projects. These moves are in line with the company’s exploration philosophy that ‘only drilling can create true project value’. Of course there is still a lot of work to be done by MEI and investors should seek professional financial advice for further information if considering this stock for their portfolio. MEI is also hoping to add to its portfolio of Canadian assets, and is actively reviewing several additional exciting Cobalt opportunities in both Canada and other jurisdictions. With its new projects on the books, exploration activity heating up, and the rising cobalt price tailwind, good times could be ahead for this $24 million-capped junior explorer.